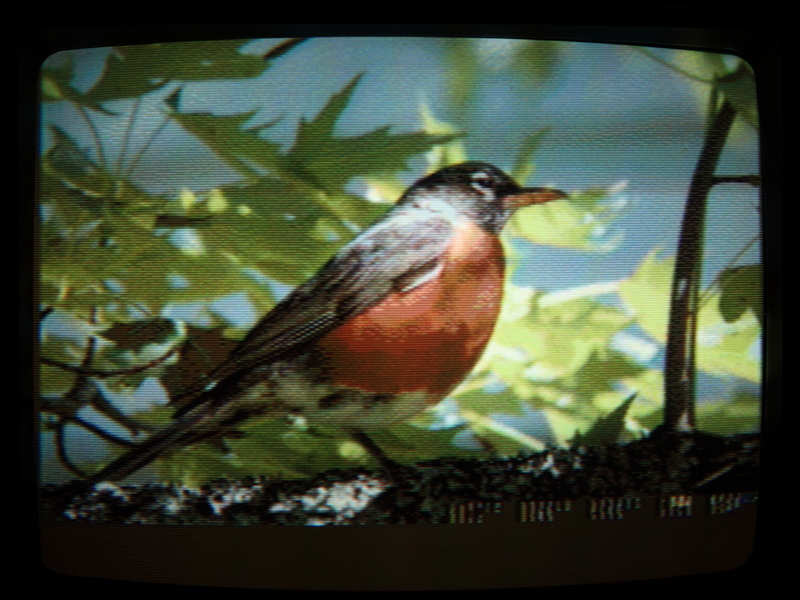 Here is a photo resized to 320x200 with some fancy color remapping and F-S dithering. This release adds experimental 8086 support. The dreaded segmented memory model has not yet been dealt with, so addressing is limited to 64KB. (Of course, inline assembly code can always modify segment registers itself.) However, the lack of 32-bit ALU is masked by the compiler which does 32-bit operations anyway. For instance, an addition compiles to an ADD AX,lowword > ADC DX,highword and then AX and DX are stored sequentially in a dword variable. This is a trade-off which sacrifices code efficiency in favor of convenience/compatibility. Check the documentation. Download the complete archive. And be sure to get Go Link from Go Tools website. This release contains bug fixes for NOSH2 and NOWUT, x87 FPU assembly support, and an OpenGL 3.2 demo. Here is the utility I constructed to make a bootable disk image for my GVP A3001 IDE interface. It's a Win32 executable (with NOWUT source) and includes a dump of the startup "LSEG" code from the original harddisk. I don't really know what this code does or where it comes from, but it's needed for booting. When creating a disk image, it's automatically copied over. After the disk image is created it can be mounted in WinUAE and an icon will appear in Workbench. It can then be formatted and have WB files copied over. Finally, the image needs to be byte-swapped (use the included HDSWAP) and written to a disk. Finding drives that work with the A3001 may be the biggest challenge. I tried the WD, a 200MB Toshiba, and a 2GB Transcend card which all failed to boot. 2019 Jan 26 The web browser from 2004 that's better than anything from this decade. I will attempt to explain one of the reasons I've become disillusioned with the web by showing how awesome a browser could be, and was, before developers went mad. 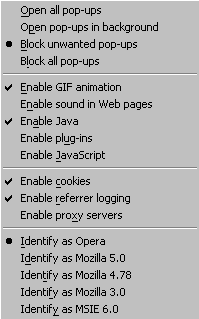 Here is a screenshot from Opera 7.54 (registered version). As you can see, it has real menus, with words and everything. There is an email/USENET reader built-in, and an IRC client, if you need those things. Now check this out. See how the link text is highlighted? That's because I pressed shift+down and selected that link. Keyboard controls can be used for nearly everything, a mouse is not needed. Then I pressed the context menu key. Look at the options that became available. New page, new window, background page, background window, download, copy link, and more. Of course, having multiple pages open in separate tabs was already old hat. In addition to opening the new page however you please, you can duplicate an existing tab. Let's say you see something interesting, but it's a little too long to read right now, and you need to look at some other items first. Just duplicate that tab and leave the dupe there for later. No need to copy and paste a URL or wait for the page to load again. You can also save your current roster of tabs as a "session" and reopen all of them again later, or next time you start the browser. There is a menu option and keyboard shortcut to reload all the open pages. I can browse photos in a local directory. I can zoom out on those big images, and hit F11 for a full screen view with plain, black border (if any). 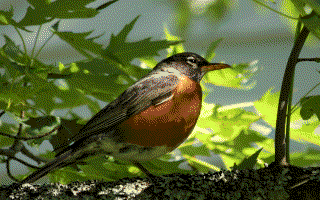 The image can be resized using a proper algorithm instead of nearest-neighbor ugliness (this is OS dependent). Then I can use the back/forward buttons, or their keyboard or mouse-gesture equivalents, to cycle through all of the photos in the directory. Now maybe the menus and toolbars were missing something important, or they took up too much space and had too many unneeded buttons. You can change it, easily. You can literally click-and-drag the buttons you want to the place you want them. Each one of the categories has additional options to pick from. I rearranged by buttons, now do I want toolbars at the top or bottom? 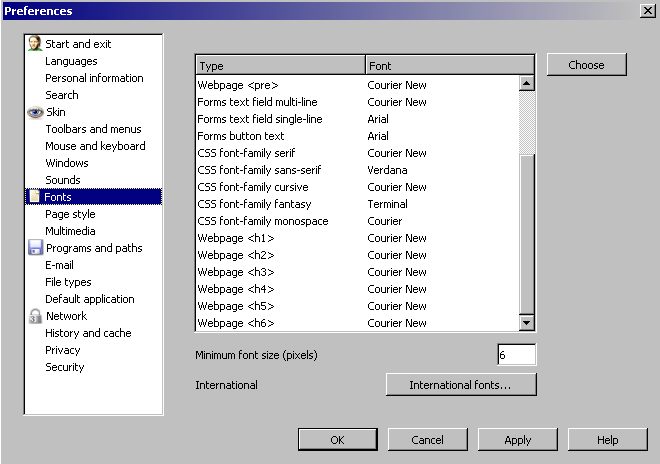 I can change fonts and a million other things too. It's all accessible through the GUI, no need to use the registry-like about:config page. I'm sure I've left out many things, but this is a good start at least. So I wanted to test some of my NOWUT demo code on my dusty old Amiga 2000. Years ago the machine had become very tempermental and I had lost interest in it. Then last year I reflowed some solder joints and reseated the 68000 and got it to boot once again. However it would not boot from the 2GB SCSI HDD that I used to use. I don't know why, and since I have no compatible SCSI interface to connect the drive to a PC, I have no way to investigate. I was left with only the 80MB Quantum HDD that I received along with the GVP A3001 CPU board. It connects to its built-in IDE interface. And now that drive is on its last legs. Having a computer that can't do anything for lack of bootable media is always an annoying situation to be in. When you have another computer nearby, usually its possible to "jump start" something, but it depends. When I got an Apple IIGS, all I had to do was load DOS 3.3 over a null modem cable and go from there. If a PC won't boot, I can take the harddisk out and connect it to a USB-IDE adaptor. When I got a 68k Mac with a dead HDD, I could not find any instructions on how to get it going again, so it had to go on the junk pile. In any case, if I were designing a computer I would definitely put a disk partitioning utility, hex/sector editor, and terminal program into ROM to make things easier. As for my A2000, it at least has an IDE interface, and I still have my old Amiga files backed up on my PC. The GVP A3001 IDE is said to have poor compatibility, but I have several old drives to try on it. Another important detail to know about it is that it swaps the upper and lower bytes when it reads/writes the disk. The first thing I tried was to create a bootable hardfile (.HDF) in WinUAE and write it to a Western Digital Caviar 1170. So how do you do that? Well, WinUAE is a bit clunky in this regard, but it is possible. First I created a blank HDF. It doesn't let you specify the exact size, it only asks for "MB" and I wasn't sure whether it used real megabytes or base 10 ones, so I put in 171. That ended up being a bit oversize, but it doesn't matter. Hit full RDB and manual geometry and put in the CHS values. You might need to exit this dialog and start again, it's a bit confusing. I partitioned. I formatted. I copied over some backed up workbench files from a PC directory. I tested whether I could boot this HDF with WinUAE. It worked. Then I attached the WD1170 to the secondary IDE port of my old Athlon XP and wrote 333,300 sectors from the HDF file using Roadkil's Sector Editor. I connected that to the Amiga. But it went to the insert disk screen. FAIL. I'm not sure if that disk image WOULD have worked... But my later experiment proved that the WD1170 is simply not useable with the GVP A3001. So at this point I took a different approach. After disconnecting the 1170 from the Athlon system, I connected the old 80MB Quantum drive again. (Bet you didn't know you could hot-plug IDE drives under Windows 2000!) Previously the drive had been making a lot of clunking noises and refusing to read certain sectors. But I tried again to dump it, using Roadkil's Sector Editor. I was able to get a complete dump with minimal clunking. It turns out that a large portion is corrupt, but I at least got the first track, and a substantial amount of the second partition (it was divided into two 40MB partitions). I kept thinking "what if I just write this dump to another disk and plug it in?" The only problem was that the Quantum drive had 965 cylinders, 10 heads, and 17 sectors, while the 1170 had 1010 cylinders, 6 heads, and 55 sectors. The geometry didn't match up, and it would never work if the system expected 10 heads and had only 6. But I looked around and found a 260MB Seagate with 1001 cylinders, 15 heads, and 34 sectors. Aha! I connected the Seagate to the Athlon XP and set the parameters in the BIOS to match the Quantum drive. Then I booted to DOS. 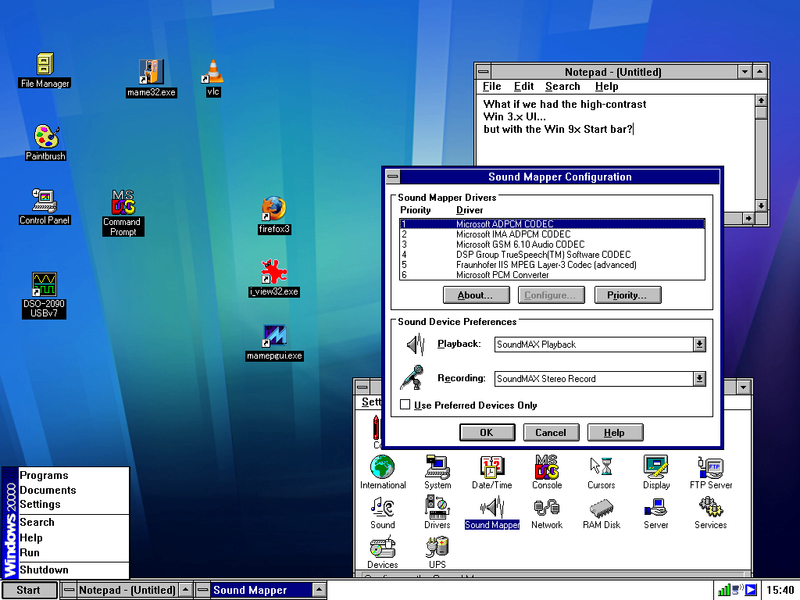 I couldn't use Windows 2000 because it bypasses the BIOS for disk access, and would surely discover the real geometry. I needed the computer to think that the CHS values were the Quantum ones, so that the disk image gets written out the way I want it to. I used Norton Diskedit for DOS to write the image. It was INCREDIBLY SLOW, for unknown reasons. Took about 3 hours to write 80MB. Having proved that the A3001 could read this Seagate drive, I wanted to get a better disk image put together that wasn't all corrupt and stuff. I found some info about the Amiga RDB, Partition block, and filesys block on the www.amigadev.elowar.com site. I found some more details on the Amiga OS Wiki. And I started writing a program to generate disk images with custom geometry, while keeping everything as close as possible to how it was layed out on in the Quantum dump, in case there are any peculiarities there that the GVP card depends on. It was at this point that I concluded that the WD1170 simply would not work with the GVP A3001. But I got the Seagate to boot to WB 3.1. However it seems that this setup isn't 100% reliable. While it does boot and run stuff, checksum errors are a regular occurence (hitting retry does the trick) and I suspect that if I were to try to write anything to the disk it would go horribly wrong. This release contains bug fixes for NO68, NOSH2, and LINKBIN. A write-through cache can only speed up reads, as writes still result in a bus cycle (and avoids potential issues with "old" data in DRAM being accessed by another CPU/device). 486DX, 68020, etc. used write-through. With a write-back policy, writes can be stored in the cache instead of going to the bus. The cache line containing the modified data eventually gets written to DRAM when it is retired. However, when a write addresses a memory area which is not currently represented in the cache, two things can happen. Either it can be treated as a write-through (486DX4 uses this scheme if I'm not mistaken), or the relevant memory can be first read into the cache. The latter is called allocate-on-write and is used on 68040 and newer x86 CPUs (it's optional on Cyrix 6x86). Allocate-on-write can result in a degradation of performance when large data blocks are written. Data from the destination area of DRAM crowds out other data in the cache, and even if it is read later (data written to a video card frame buffer may not ever be read by the CPU) it is likely to still result in a miss. The improved efficiency of transferring an entire cache line at once in a burst, instead of accessing DRAM one word at a time, can mitigate slow-downs resulting from allocate-on-write while maintaining the advantages. Some socket 7 chipsets (eg. Via VP, MVP) don't do write bursts. If large data blocks are written one byte at time, rather than using 32- or 64-bit words, the reduced number of bus cycles using allocate-on-write may save more time than is lost by doing pointless reads before hand. A scheme called write-gathering or write-combining is used in specific circumstances (eg. video card frame buffer memory) to hold sequential writes in a buffer, without reading any data first, and then execute one large write. New version of my bitmap editor IMGTOOL. 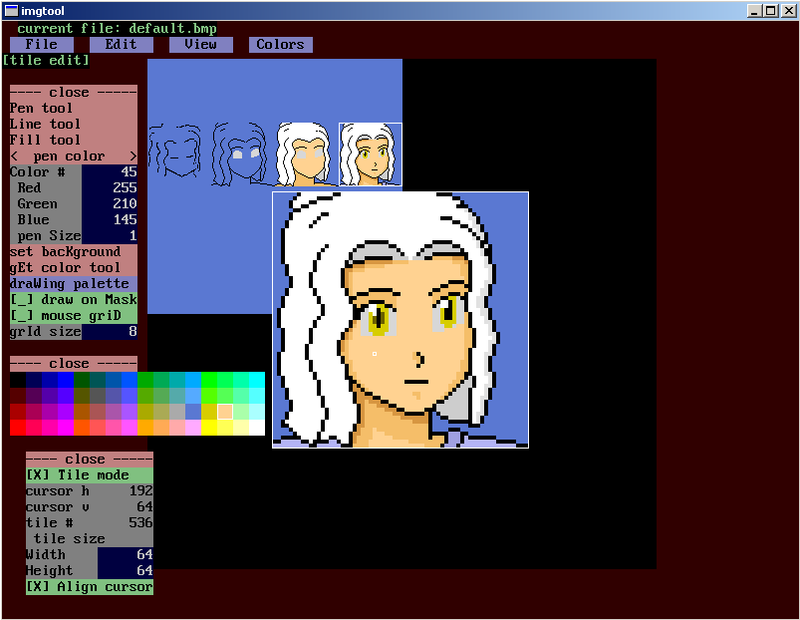 Has a lot of loose ends at the moment, but also many new features like tile/pixel editor modes. Time for a release! Includes FreeBASIC source and DOS/Win32 executables. Download the complete archive. 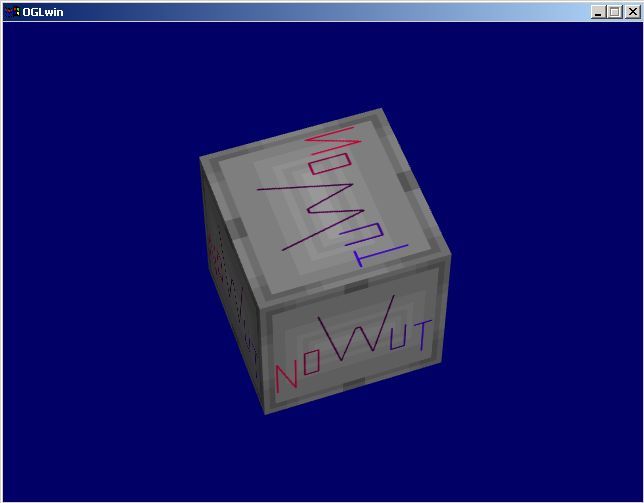 This is the first release of the NOWUT cross compiler for the low-level NOWUT language. It runs on Win32 and targets x86, Amiga 68K, X68000, Sega 32x and Saturn. Check the documentation. Download the complete archive. RISC CPUs sometimes employ a delayed branch, where the instruction immediately after the branch instruction is always executed, hence avoiding some disruption of the pipeline. RISC CPUs also tend not to allow immediate data (data following the opcode) to be used as operands. This is regrettable from a programming standpoint, and seems like it would be a mixed-bag from a performance standpoint, since a memory access has to occur somewhere else to load that data. So... what if, like a delayed branch, we had delayed immediate data? You could load a DWORD into a register with one instruction, but the data could go further down the stream. To be more specific, imagine that your CPU used a general purpose register as the program counter (eg. R15), and that you had a post-increment register-indirect addressing mode available to commonly used instructions. Loading from (R15+) would be the same thing as loading immediate data conceptually. You just have to assume that R15 was pointing at the location following the opcode, and that the post-increment would cause it to skip over the data before the next instruction fetch. Those assumptions wouldn't hold on a pipelined CPU, but perhaps the "delayed immediate" would make the situation workable, by lining up the data load and the "skip" with the proper pipeline stage of the opcode that needed it. I also tested an IBM AT (286) loaded up with ISA memory board, VGA, sound, disk controller, and 3.5" harddisk. It drew 32W. A VLB 486DX4-100 system drew 28W.